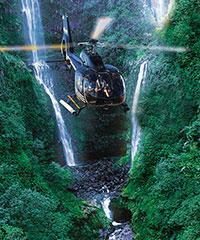 Hawaii Helicopters Tours show you the 75% of Hawaii you can't see from the ground. 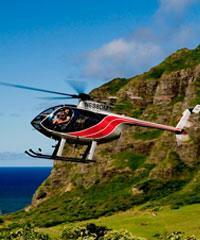 Hawaii helicopter tours provide perhaps the most magnificent way to see the islands. 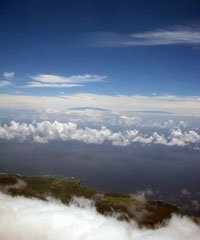 The fact that fully 75% of the islands of Hawaii can only be seen from the air makes Hawaii helicopter Tours that much more special. The geological nature of each island is such that the central and highest points of each island are often the most remote, and the most accessible areas are the ones found along the coastlines. 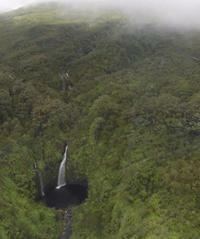 Hawaii helicopter rides have the unique capability to fly into these areas and hover in valleys, alongside mountain ridges, next to mountain peaks and right next to Waterfalls. 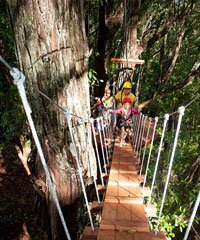 It is for this reason that Hawaii helicopter tours rank at the top of the list of categories of activities that visitors to Hawaii enjoy. 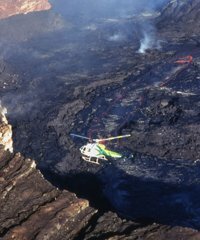 Hundreds of thousands of people have had the opportunity over the years to see the islands on one of the many Hawaii helicopters. 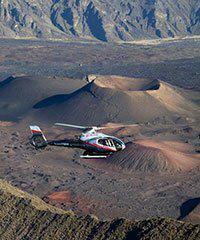 Each island has multiple helicopter touring companies and on most days they run continuously taking small groups in each aircraft into the wild interior of one of the world's most exotic destinations. 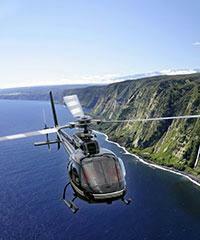 Hawaii helicopter tours are so popular that often it is impossible to arrange for rides for days on end. 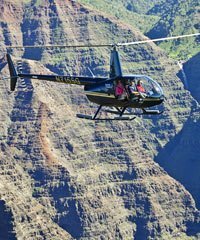 In fact during the most coveted time for helicopter viewing, in the morning hours when the visibility is usually best, we can often be stacked back even further when attempting to book one of our Hawaii helicopter rides. 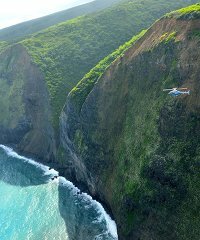 When deciding which island would be best for taking one of your helicopter tours in Hawaii you will be faced with some difficult choices, because in all reality, all the Hawaii helicopter tours are sensational in their own way. 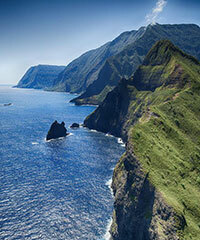 The five major islands that are the prime targets for helicopter flights are Kauai, Oahu, Maui and Molokai (which are often viewed together), and the Big Island. Each island is quite different mostly because of the age of each island and the time that Mother Nature has had to transform each of them. 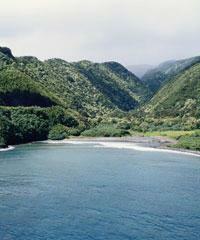 From a geological perspective the very oldest of the islands is Kauai and the youngest is the Big Island. 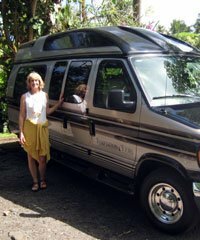 Second oldest would be Oahu, then Molokai and Maui and this age factor plays a big role in the actual appearance of each of the islands. 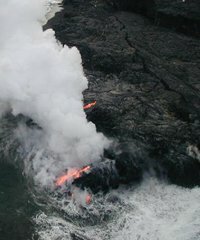 Kauai's volcanoes have been extinct for about five-million years, Oahu's for about three-million, Maui's for about a million (true for West Maui Mountains but Haleakala is still considered dormant) and on the Island of Hawaii the volcanoes are still active. What all this means for you as a visitor viewing these islands from above on a Hawaii helicopter ride is that on the oldest islands you will see signs of much more erosion, much more sculpted cliffs and mountain ridges and as you proceed to the newest of the islands this affect will be less pronounced and when you come to the huge Hawaiian mountains of Haleakala on Maui and Mauna Loa and Mauna Kea on the Big Island you will see mountains shaped more like a big bell curve and see much more in the way of vast sheaths of lava plain which blanket the horizon like a parking lot for miles on end. 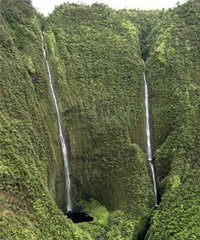 From a historical perspective, the island of Kauai was the first of the Hawaiian Islands to ever be flown over by Hawaii helicopters for the purpose of an air tour. 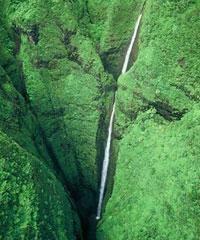 For many people Kauai may be their favorite island for a helicopter flight and it has been said by many that the island of Kauai is considered the most beautiful of all the islands, particularly from the air. 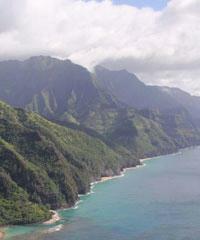 Seeing the Na Pali Coast on Kauai from the viewpoint of helicopter tour in Hawaii will be one of the highlights of your time in Hawaii. 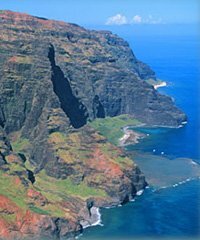 This coastline is so remote that it can only be seen from the vantage point of a helicopter or from the vantage point of a boat at sea and its towering cliffs descending thousands of feet into the ocean below are one of the most breathtaking and marvelous sights to be seen on the planet. 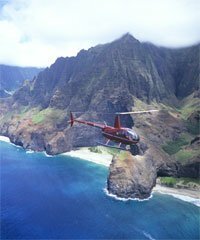 Oahu is thought to be simply the island with the largest population of all the Hawaiian Islands (it is) but few realize that the interior regions of Oahu are an amazement to be viewed from a Hawaii helicopter tour. 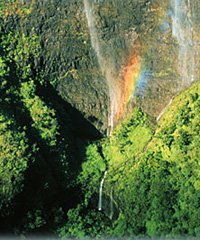 Certain areas of Oahu are so dramatically beautiful that they have been used as the backdrop for some of the major and most popular motion pictures and television series to be filmed over the past half century. 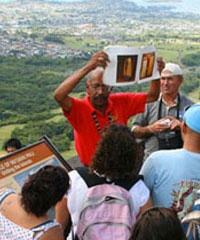 The cities and towns of Oahu have their own appeal from the perspective of Hawaii helicopter rides. 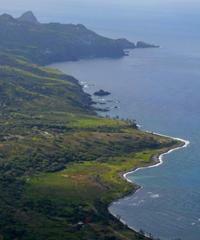 The encroachment of neighborhoods and subdivisions into the very base of the interior regions of the island gives the impression of fingers crawling up the mountains and at once being thwarted by mammoth cliffs or steep valleys. Hawaii helicopters that fly over the landscapes of these two sister islands are treated to a series of spectacles ranging from the highest sea cliffs in the world on Molokai, Father Damien's famous leper colony on Molokai, the remarkable interior of the West Maui Mountains on Maui which is considered to be the second wettest spot on earth (second only to Kauai) and the amazing Crater of Haleakala which spans like a circular moonscape twenty-one miles in circumference and descends 3000' from its rim to its floor beneath. 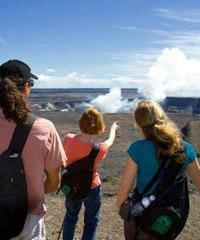 The Big Island comes with its own fiery charm and helicopter tours of Hawaii Island are greeted with one of the rarest spectacles on earth, a real and live active volcano. 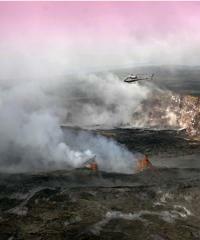 Hawaii helicopter tours fly over molten lava flowing through lava tubes cracked and visible from the air to their fiery and explosive destination where hot lava meets a cool ocean in a detonation of the elements. 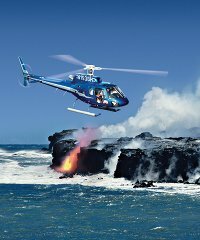 Few sites will imprint your imagination with such power and impact as the view of the phenomenal power of Mother Nature as can be seen on one of these miraculous Hawaii helicopter rides. 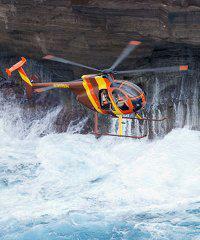 There Are Many Different Types of Hawaii Helicopter Aircraft. 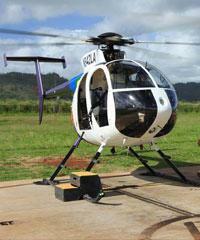 Of all the different types of aircraft the most prevalent is the A-Star helicopter. 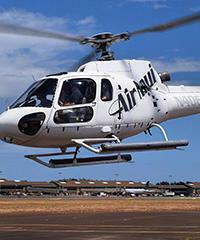 The A-Star can perhaps be considered the "gold-standard" for Hawaii helicopters in that it has some of the best visibility of all aircraft flown yet is not the most pricey. 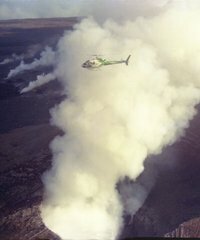 The Cadillac of all helicopters would be the Whisper-Star or Eco-Star aircraft which is a more deluxe version of the A-Star and is also the only helicopter in Hawaii in some cases which allows for the pre-purchase of guaranteed front seat viewing. 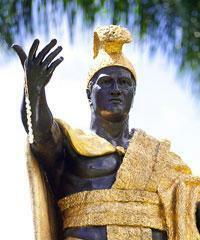 As you might surmise, the cost is more but may well be worth it. 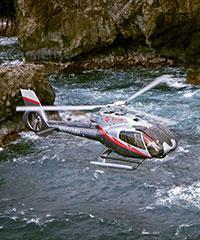 One of the most maneuverable and intimate of the types of helicopters in use is the Hughes 500. 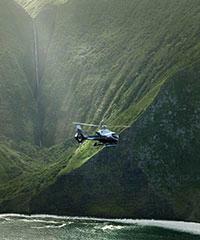 These Aircraft are a favorite of photographers as they offer the capability of having the doors removed. This provides an unencumbered, if not somewhat uncanny view of the landscape below that allows them to take photos from heights thousands of feet in the heavens. 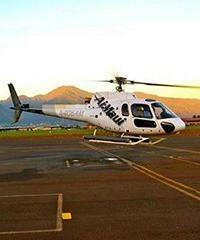 Though less used than in previous years some Hawaii helicopter companies make use of the Bell Jet Rangers and have a seating of one passenger in the front with the pilot along with three passengers in the rear of the craft. The Robinson 44 is another smaller aircraft which also has a doors-off option and specializes in just carrying two passengers at a time.